Jeremy Renner wore a silver ring on his finger at the press junket Monday for his new film, “Kill the Messenger,” but no one thought much about it. It turns out it is a wedding ring; the 43 year-old actor told CBS News that he secretly got hitched to Sonni Pacheco, the mother of his baby girl. The movie is based on Webb’s book, “Dark Alliance,” in which the journalist defended the accuracy of his articles, and a 2004 biography of Webb by Nick Schou, which gave the move its title. The movie is sympathetic to the journalist and should reinstate his reputation. There is an embargo on reviewing the movie until it opens October 10, but I can say it is powerful and exciting and the ending, even though it is old news, is so stunning I was glued to my seat for a good five minutes after the movie ended. This movie could garner Renner another Academy Award nomination. 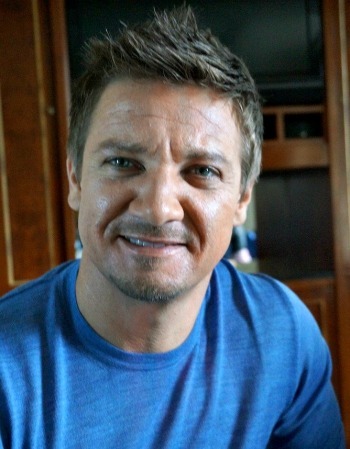 Renner has five very hot movies in the pipeline including “Mission Impossible: 5,” which he is shooting in London now after three weeks filming in Morocco. He’s also got a little indie movie coming out next year you might have heard of called “Avengers: Age of Ultron.” He’s under some crazy gag order, but he did hint what’s ahead for his character Hawkeye and his alter ego Clint Barton.